The world is ending. Your merchant account has been closed. What do you do now?! If you suspect your acquiring bank is going to close your account, your acquirer has issued a notice for an upcoming closure, or your processing agreement has actually been terminated, there are several things you need to know. 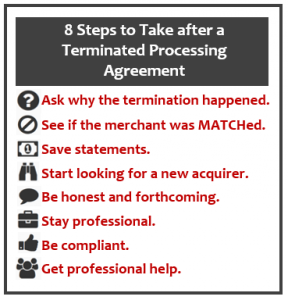 A terminated processing agreement and closed merchant account has several long-term ramifications that will impact how a business operates. The first thing business owners need to understand is that a merchant account isn’t a depository account like a consumer checking or savings account. A merchant account is a line of credit. In fact, there are two lines of credit used to facilitate a single credit card transaction. The customer first takes advantage of the line of credit made available by the card network (Visa, Mastercard). The card network extends credit to the cardholder by making the payment on the cardholder’s behalf. Later, the cardholder repays the network after receiving the monthly statement. What you don’t know can hurt you: our Merchant Compliance Review optimizes your chargeback responses for maximum profitability. Because the card network extends credit to the cardholder, the acquiring bank must also extend credit to the merchant. The acquirer deposits funds into the merchant account before the cardholder has actually made payment. The merchant could go out of business. Chargeback costs could exceed the account balance. The merchant could engage in fraud, intentionally cheating customers and the bank. Acquirers rightfully look after their own assets. If the bank suspects elevated risk brought about by a particular merchant, the safest option is to simply terminate the processing agreement and close the merchant account. Suspicious Merchant Activity: There are several ways merchants might choose to breach the terms of their merchant processing agreement. This might include depositing transactions on behalf of another merchant or maintaining multiple merchant accounts (acquirers usually require merchants to refrain from simultaneously having active accounts with other acquirers). Fraud: If a merchant is committing fraud, the acquirer will understandably terminate the account. Examples of fraud include misusing credit card information, making fraudulent transactions, overcharging customers, not delivering merchandise, and using misleading advertising. Chargebacks: Chargebacks, or forced credit card refunds, are the leading cause of terminated processing agreements. It is important to remember acquiring banks and processors are like any other business; they must carefully assess risk in relation to profitability. Therefore, a processing agreement will be terminated before the risky merchant can become a liability. 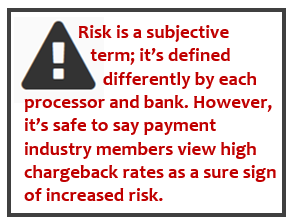 Unfortunately, “risk” is a subjective term; it is defined differently by each processor and bank. However, it is safe to say all payment industry members definitely view high chargeback rates as risky. The majority of canceled merchant accounts are caused by excessive chargeback levels. The networks usually require merchants to keep their chargeback ratio below 1-2% (be sure to check the specifics regarding Mastercard chargeback thresholds and Visa chargeback thresholds). However, it’s probable that a merchant account will be closed long before the card networks’ thresholds have been breached. Merchant account reserves are common practice for high risk payment processing. Because of the increased risk level, acquirers withhold a portion of the merchant’s revenue to cover potential losses. The bank will use the reserve account to cover losses if the operating account doesn’t have sufficient funds. The amount to be withheld will be laid out in the merchant agreement. Some banks will require a reserve upfront. For example, the merchant might be required to provide the equivalent of one to two months’ worth of anticipated sales. Or, a rolling reserve will hold back a percentage of sales each month. If a hold is newly implemented on a merchant account, it should be seen as a warning sign that trouble is brewing. Merchants who experience an unexpected revenue hold or don’t receive a regular deposit should not assume a technical glitch is at fault! Take action right away. Merchants need to contact their account representative or the processor’s customer service department immediately to find out what is causing the issue. If possible, the merchant should try resolving the misunderstanding with the risk manager. Merchants can also call an Account Executive at Chargebacks911® (877-634-9808). If the acquirer holds funds, it is an indicator that the merchant account will probably be closed before the end of the month. If funds weren’t withheld before the processing agreement was terminated, money will be held after the account is closed. Again, the amount withheld will depend on the merchant account agreement. However, merchants can expect the acquirer to retain revenue to cover at least all the open authorizations. Usually, the acquirer will freeze the merchant’s funds for several months. If recent customers file chargebacks, the bank needs to be able to reimburse those cardholders. If your merchant account has been closed, long-term ramifications will impact how you do business. A canceled merchant account is a serious setback for a business, but it doesn’t necessarily need to be the death blow that kills the endeavor. 1. Ask why the termination happened. Merchants shouldn’t assume they understand the reasoning for the account cancellation. It’s important to know the absolute truth. Plus, merchants will need to provide a written statement from their previous acquirer when applying for a new merchant account. 2. See if the merchant was MATCHed. The MATCH List (Member Alert to Control High-Risk Merchants) is a database with information about businesses and owners whose merchant account has been canceled. The networks require banks to report all terminated merchant accounts to the MATCH List. Ensure the business has, in fact, been MATCHed. The application process for a new merchant account is different for businesses that have not been placed on the MATCH List. Merchants should have at least the last six months’ worth of processing statements. Before losing access to the acquirer’s online reporting system, merchants should double check they have all the necessary paperwork. 4. Start looking for a new acquirer. Placement on the MATCH List following a canceled merchant agreement isn’t ideal, but it isn’t an impossible situation to overcome. It is possible to secure a new merchant account. Merchants shouldn’t waste their time contacting regular acquirers though. Financial institutions like First Data or Bank of America won’t sign a business with a terminated merchant account. Merchants need to recognize their limitations. Instead, go straight to a high risk merchant account provider. 5. Be honest and forthcoming. Many merchants are tempted to make their situation seem better than it is. They assume this makes them more appealing to the prospective acquirer. In reality, it is a damaging tactic that will probably backfire (most likely in the form of increased rates). The acquirer will learn of the merchant’s past indiscretions anyway; it is best to acknowledge them upfront so as not to sacrifice the acquirer’s trust. It takes a long time to underwrite a high risk account (much longer than a traditional account). Don’t try to rush the system. Relax. The acquirer probably dislikes the excess paperwork just as much as the merchant! Acquirers will scrutinize any new merchant, but will be especially cautious of those with a previously canceled merchant account. The bank will carefully monitor the merchant’s activity to ensure the new account is compliant with the current merchant agreement. As long as merchants are fully compliant with all aspects of the merchant agreement, they shouldn’t have anything to worry about. If your merchant account has been canceled or is in imminent danger of termination, it is imperative that you contact Chargebacks911 as soon as possible. You’ll be faced with numerous hurdles, including issuing refunds to customers, retrieving revenue, and managing future chargebacks. We can help, but in situations like these, you don’t have a moment to lose. Chargebacks911 offers a guaranteed ROI. If our services aren’t a good fit for your business or we can’t help you with your current predicament, we’ll let you know.